Let us help you plan your Dreamscape from start to finish or use your existing plan! We utilize a variety of trusted local sources for our hardy trees, shrubs, perennials, grasses and flowering varieties to ensure hardy specimens that can thrive in the Berks and Lehigh county. First we implement a careful analysis of your planned space, large or small. Soil heath, available sunshine and irrigation needs are carefully considered before a quote and design is submitted. Focal points, unique specimens, possible ground covers and perennials are suggested. By researching the unique characteristics of your space, a sustainable and appropriate solution is formulated based on your color and design interests. Design and Implementation of Trees, Shrubs, Perennials, Grasses & Flowers for your Unique Space. 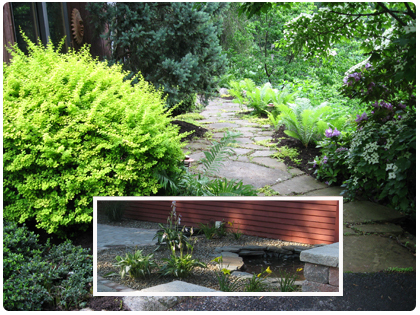 Waterworks, Stone Pathways and Feature Specimens to make it POP!